Andy and I joke sometimes that there are some things that are too good for our baby. These are usually ridiculously expensive items like the Vetro Acrylic crib. Often the it’s things that just seem unnecessary, like a wipe warmer. It’s a cold wipe world, kiddo. Get used to it. My latest addition to the list, the Summer Infant Lil’ Luxuries Whirlpool Bubbling Spa & Shower. What?! Why? What baby needs to relax in a mini hot tub? All babies do is relax. 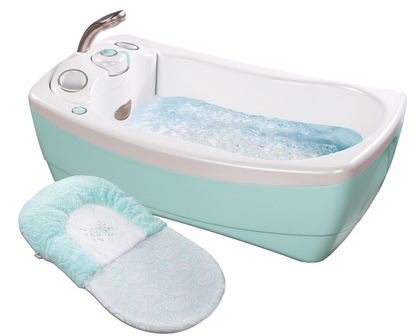 “The swirling waters, coupled with instantly calming vibrations, pamper your baby like no other tub can.” Admittedly, I’m not a huge fan of hot tubs but I don’t think my baby’s bathtub should be working hard to pamper her. Hold the water for splashy playtime and getting clean and that’s it, thank you. That thing is essentially one of those tubs Brookstone sells to put your feet in. See? I think I’m going to start a small series called TGFTB (too good for The Biscuit) to catalog silliness like this.